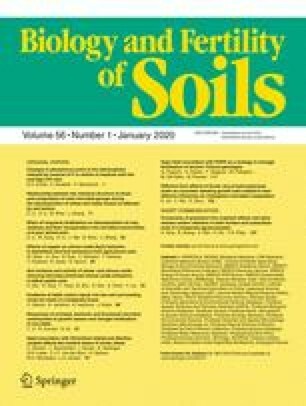 The phosphate-solubilizing potential of the rhizosphere microbial community in mangroves was demonstrated when culture media supplemented with insoluble, tribasic calcium phosphate, and incubated with roots of black (Avicennia germinans L.) and white [Laguncularia racemosa (L.) Gaertn.] mangrove became transparent after a few days of incubation. Thirteen phosphate-solubilizing bacterial strains were isolated from the rhizosphere of both species of mangroves: Bacillus amyloliquefaciens, Bacillus licheniformis, Bacillus atrophaeus, Paenibacillus macerans, Vibrio proteolyticus, Xanthobacter agilis, Enterobacter aerogenes, Enterobacter taylorae, Enterobacter asburiae, Kluyvera cryocrescens, Pseudomonas stutzeri, and Chryseomonas luteola. One bacterial isolate could not be identified. The rhizosphere of black mangroves also yielded the fungus Aspergillus niger. The phosphate-solubilizing activity of the isolates was first qualitatively evaluated by the formation of halos (clear zones) around the colonies growing on solid medium containing tribasic calcium phosphate as a sole phosphorus source. Spectrophotometric quantification of phosphate solubilization showed that all bacterial species and A. niger solubilized insoluble phosphate well in a liquid medium, and that V. proteolyticus was the most active solubilizing species among the bacteria. Gas chromatographic analyses of cell-free spent culture medium from the various bacteria demonstrated the presence of 11 identified, and several unidentified, volatile and nonvolatile organic acids. Those most commonly produced by different species were lactic, succinic, isovaleric, isobutyric, and acetic acids. Most of the bacterial species produced more than one organic acid whereas A. niger produced only succinic acid. We propose the production of organic acids by these mangrove rhizosphere microorganisms as a possible mechanism involved in the solubilization of insoluble calcium phosphate.